I listened to Bad Blood so my notes are based on key points I remember–I did not take notes. I’m still amazed by the subject matter and the key person behind the story of a failed Silicon Valley startup. Wall Street Journal author John Carreyrou chronicles the beginning and the end of Theranos founded by Elizabeth Holmes. Parts of it reads like a fictional thriller. Theranos was created to manufacture a simple blood test without the need for intimidating, invasive needles. However, the company was never able to create such a product that worked, and that led to false claims by the founder in order to keep investment funds flowing to Theranos. Elizabeth Holmes founded the company after dropping out of Standford University at the age of 19. Holmes stated she created the company due to her intense fear of needles. Why Did the Founder Deceive So Many? Certain leaders of Theranos became bullies of disenchanted employees who left the firm delivering a faulty product. That’s what I found jarring in this story. One of the heroes in this book is the grandson of former U.S. Secretary of State, George Schultz. 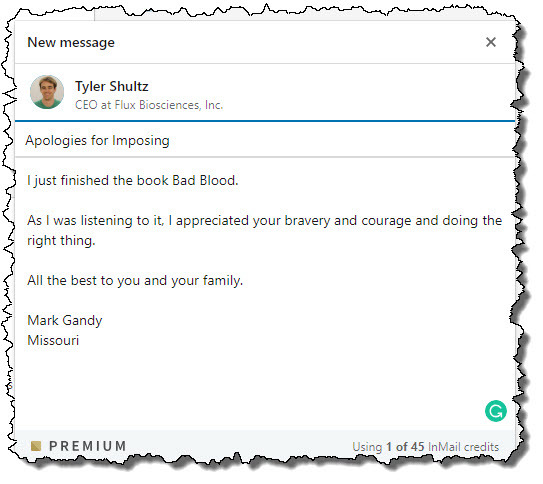 Tyler Schultz quit his lab position at Theranos after 8 months on the job because he could not overlook the ethical flaws of his employer. 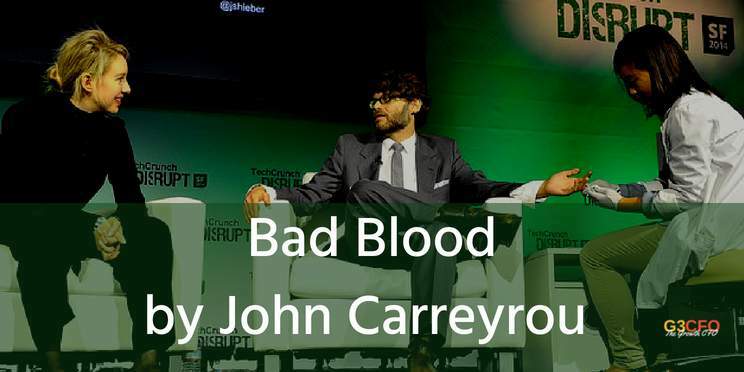 Tyler was then intimidated multiple times by the Theranos law firm, and his speaking to the press ultimately resulted in the estrangement from his grandfather who was on their Board of Directors. I still believe at one time Holmes had pure motives when she started Theranos. Carreyrou’s final words sum up my thoughts about this startup founder. Carreyrou, John. Bad Blood: Secrets and Lies in a Silicon Valley Startup (p. 341). Knopf Doubleday Publishing Group. Kindle Edition. I do not recall this story at all as the story unfolded. I happened upon the title during some weekly surfing on both Amazon and Audible. As I started listening to the book, I had a difficult time in wanting to shut it off. The book is absorbing and you’ll find yourself getting angry with certain characters in the book including Holmes. I feel for any customers who used the Theranos testing process that provided inaccurate results. I feel for employees who were bullied and intimidated when they elected to leave the company for the right reasons. I even feel for the author who had to put up with Holmes and her legal team trying to discredit the writer before and after publishing his first account about the legitimacy of the Theranos blood testing technology. Want to know the first thing I did after finishing the book? I thanked the author on Twitter. And my next act? I sent a note of encouragement to Tyler Schultz through LinkedIn. As of this writing, he had not responded, nor do I expect him to do so. Title Photo Attribution: TechCrunch with slight modifications.